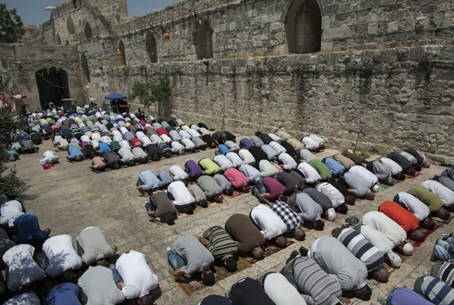 Following request from Muslim student, Bar Ilan University's administration agrees to set aside one room for Muslim prayers. The Bar Ilan University, which is located in Ramat Gan, not far from Tel Aviv, will introduce a prayer room for Muslims. Following a request from a Muslim student, the student union at the university turned to the administration and asked it to set aside a room on campus to be used as a prayer room for Muslim students. The student who made the request, Abed Sharkiya, said that about 500 devout Muslims who study at Bar Ilan encounter a problem on a daily basis, whereby there is no room for them to pray in private and they often are forced to pray in classrooms or on the grass outside, a fact which causes discomfort. The administration at Bar Ilan has agreed, following talks with the student union, to set aside one room which will be designated for Muslim prayers according to traditional prayer hours. Matan Bar Noy, head of the student union at Bar Ilan, welcomed the decision.